Once upon a time, Labour had a vibrant tradition of grassroots activism that fought tooth-and-nail for working class interests. But this is no more; and despite Jeremy Corybn’s electrifying leadership campaign, Labour, has for some time been beholden to corporate interests. Although marginally better than the Tories, Labour is widely considered to be a hollow shell of its former self. Trade Unions represent the final remnants of functioning democracy existing within the Labour Party. So Elliot Akinwumi’s short letter (August 18, Leicester Mercury) literally works miracles by so utterly mangling the truth; which he does by saying unions, by backing Corbyn, are “hell-bent on destroying the Labour Party”. Not keen to acknowledge the obvious reasons why the majority of British people are supporting Corbyn, Akinwumi reminisces about Labour’s apparently “extraordinary leaders” like Tony Blair and Neil Kinnock. 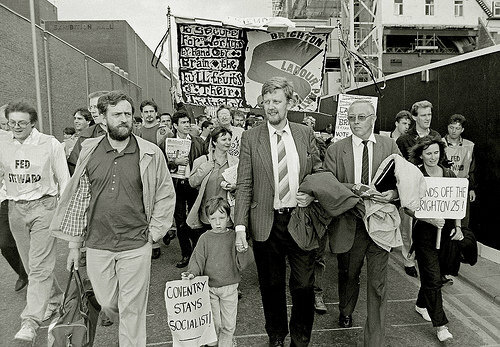 This deadly duo, however, are reviled by the working class, and while Akinwumi says that unions are the “enemy within,” it is worth recalling that Kinnock played a disgusting role in undermining working class organisations during the 1980s. Little wonder Kinnock was featured as a leading antagonist against unions in the book, The Enemy Within: The Secret War Against the Miners. I would also question this person’s ideas about the Labour Party, given that it was a Tory – Thatcher – that first coined the phrase ‘the enemy within’ about the National Union of Minerworkers. Alongside Akinwumi’s bizarre attack on unions, John Thomas’s letter announces his joy that his friend and one-time colleague, former Labour County Councillor Denis Bown, is still writing to the Mercury (August 6), putting forth “moderate, middle of the road” policies. Just last month Leicester bore witness to one of the city’s biggest political meetings for years: Corbyn had come to town, and 300 enthused Labour supporters crammed in close to listen to his distinctively left-wing politics. With the same massive levels of public enthusiasm being duplicated across the country, we have a clear demonstration of the support that exists for a politics that extends beyond the usual Westminster nonsense of tweedledum and tweedledee. As Dr Alistair Jones points out in his first-person piece (August 18, Mercury), by raising the importance of challenging austerity, “Corbyn’s position has engaged with many people who previously felt disengaged with politics.” But importantly, the same is also true for long-standing Labour Party members, with Corbyn having attracted by far the most constituency party nominations. This letter was emailed to the Leicester Mercury mailbox on 18th August. National political history made local – very instructive. Great post.